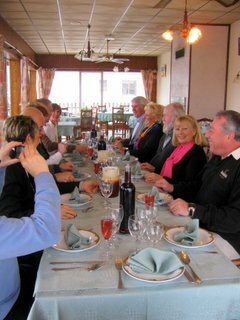 We all met at La Bellerive Wednesday to celebrate Helen's birthday. 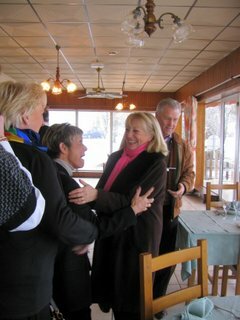 That's the birthday girl in the hot pink scarf. It was a total surprise for her arranged by Eddy. The total surprise for us was we managed to make it happen despite an all-day snowfall! We had fun despite the weather. It looks a very fine occasion! Looks like a lot of fun. But how on earth did you get there, if this is the restaurant at Najac I'm thinking of? We were totally stuck on Wednesday and are still having difficulties. Darn those names that keep repeating themselves all over France! This La Bellerive is actually only about 20 minutes from here in the Lot River valley. And we didn't get the same amount of snow here...only about 3-4 inches. I was supposed to drive, but persuaded a friend to drive instead who has a Landrover...good high clearance on the snow and slush filled road. We did all question our sanity, tho, making the trip! Thirty Photos in Thirty Days!